This was a series that I hadn’t heard anything about. The author and the series were completely new to me but I fell in love with the cover and was eager to see what it was about. I am always on the look out for new historical mysteries and Kensington Books have a slew of authors that I have come to enjoy over the years. Finally summoning courage to face the past, Lane Sanders breaks away from her busy job at City Hall to confront childhood nightmares in Rochester, Michigan. An unknown assailant left Lane with scattered memories after viciously murdering her parents. 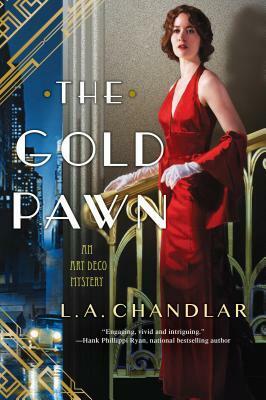 However, one memory of a dazzling solid gold pawn piece remains–and with it lies a startling connection between the midwestern tragedy and a current mystery haunting the Big Apple . . . Meanwhile, fears climb in Manhattan after the disappearance of a respected banker and family friend threatens the crippled financial industry and the pristine reputation of Lane’s virtuous boss, Mayor Fiorello “Fio” La Guardia. Fio’s fight to restore order leads him into more trouble as he meets a familiar foe intent on ending his mayoral term–and his life . . . Guided by overseas telegrams from the man she loves and painful memories, only Lane can silence old ghosts and derail present-day schemes. But when the investigation awakens a darker side of her own nature, will she and New York City’s most prominent movers and shakers still forge ahead into a prosperous new age . . . or is history doomed to repeat itself? (summary from Goodreads). So this is the second book in a new series and even though I missed the first book, I didn’t feel like I couldn’t read this one. The author did a great job orientating the readers so that they didn’t miss too much from the first book. Of course there are things I have missed from the first book, but I didn’t feel like I couldn’t get through the book without reading the first one. Though that said, I liked this one enough that I want to go back and read the first book. The thing I love about historical mysteries, especially ‘lady detective’ mysteries, is a lot of them are less serious than run of the mill thrillers. I use reading as an escape so often I want something light hearted and fun to read. It doesn’t always have to be serious or earth shattering. This book was exactly that for me. It was at times silly, but in the best sort of way. I enjoyed reading it quite a bit and the mystery as fun to solve right along side Lane. On that note, I loved Lane. She fills the roll of independent woman just right. She has a dynamic personality with lots of layers still left to discover. I am excited to see how she grows and changes throughout the series. The 1930s aren’t really my era but I thought that Lane was a progressive woman that fit nicely in the period, though she was a more ‘modern’ woman. The author has done a great job with her historical research. As I said, the 1930s aren’t my favorite era, but they could be for this book. The beauty and the glamour of the era were evident in this book. While the protagonist and the historical details were well done, the language and dialogue were a little plain. I noted that some other reviewers felt the same and I would have to agree. It wasn’t boring but it didn’t stand out either. For me dialogue needs to jump off the page and drive the story, in this case it seemed to just steer the story rather than propel it forward. One final note—this cover hit all the high notes. It’s interesting, elegant, and totally oozes art deco. Whoever designed the cover did an outstanding job! I love the red and gold together and if I saw it in a bookstore, I would grab it off the shelf without hesitation! Overall I left this book feeling satisfied. It a fun mystery with an interesting main character. I would gladly read more books by this author and am looking forward to reading the first book in the series as well as the next one!